When I asked the best of all husbands what kind of cake he would like for his birthday I was pretty sure that he would wish Sachertorte, as usual (he always orders Wiener Schnitzel when we are in Germany, too.) 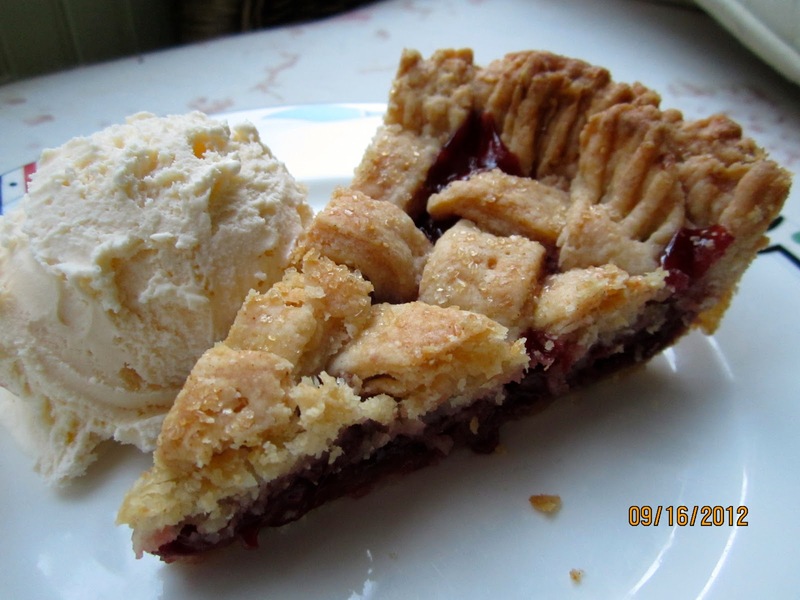 But with an impish grin he retorted: “SOUR CHERRY PIE!”. In principle there’s nothing wrong with that – I love pies – but this is a hot button issue in this house. My late mother-in-law was an excellent cook, and, although, like me, an American by marriage only, she mastered this Anglo-American pastry to perfection. My first trials at making a pie crust ended the same way as my first efforts to bake muffins. As a German used to mix the heck out of cake batters so that no loose flour or (shudder!) lumps of butter remain, my muffins resembled mini pound cakes and my pie bottoms short crust. After diligently studying numerous baking books and food magazines I finally managed to produce a buttery pie crust that was neither tough, nor too brittle, and didn’t get damaged in transition to the pie pan. “Not bad,” conceded my spouse – but somehow the cherry filling of his mother tasted better! That was the last straw – I’d had it. I swore I would never bake another cherry pie as long as stark ingratitude and unflattering comparisons could be expected in this household. Not that I didn’t try to pry the secret of her cherry pie from my wily Venetian mother-in-law when she was still alive. 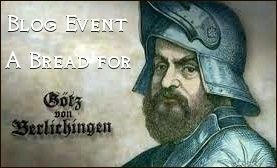 But she eluded easily all sneaky trials to find out, and direct frontal attacks she parried by claiming old age and forgetfulness. I like my pie crusts a little heartier, and exchange a quarter of the white flour with whole wheat or spelt, or, sometimes, substitute 2 tablespoons of flour with nutmeal. 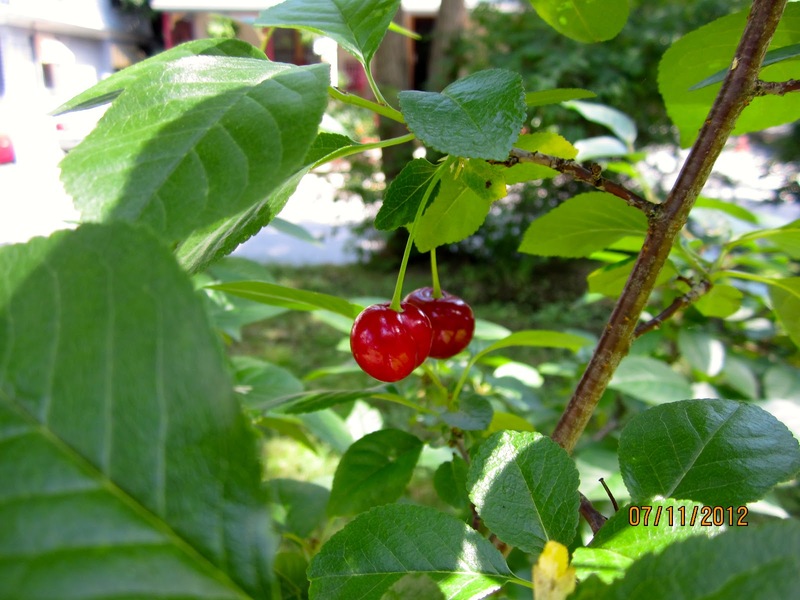 Unfortunately, fresh sour cherries are hard to find in Maine – my own harvest was still a bit too meager this year. Therefore I use lightly sweetened Morello cherries from a glass. Our little sour cherry tree had 5 cherries this year! For the filling I adapted a recipe from William-Sonoma “Pie & Tart”, but reduced the sugar content and added some lemon zest. 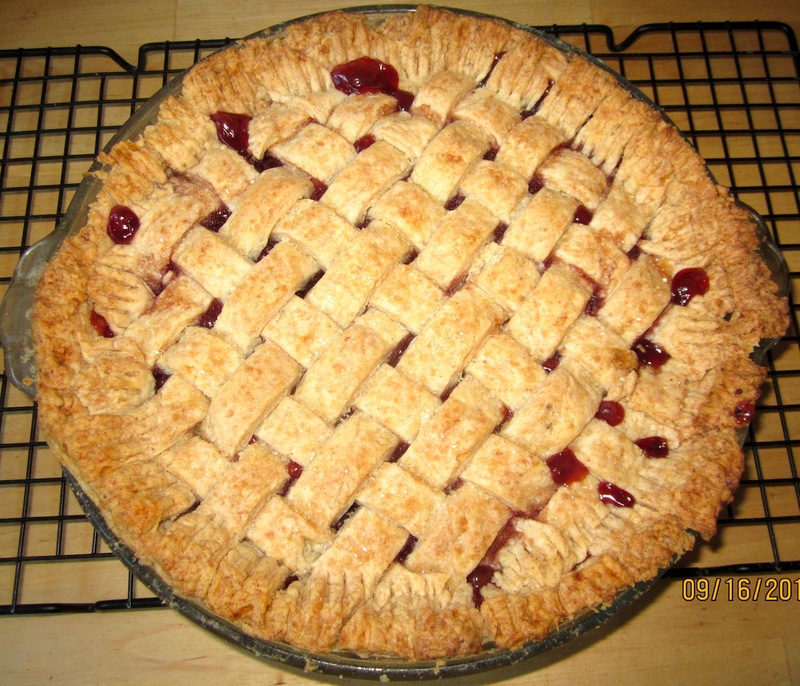 The pie has a decorative lattice top that is easier to make than it looks. Here you find instructions on how to weave it. You can prepare the crust using a food processor or stand mixer. But keep in mind: for the food processor the fats have to be ice cold, but for the stand mixer fat at room temperature works best. *) if you use a mixer instead of a food processors, the fats have to be at room temperature! Briefly pulse 200 g (1 1/2 cups) of the flour with salt and sugar. Add butter and shortening, and process, until uneven clumps (like cottage cheese curds) start to form, and all flour is coated. Scrape bowl with rubber spatula and redistribute dough evenly. Add remaining flour and pulse 4 – 6 times, until mixture is evenly distributed around bowl and has been broken up. Empty mixture into medium bowl. (Butter and shortening have to be at room temperature.) Briefly mix 2/3 of the flour, salt and sugar at medium-low speed, until combined. Add butter and shortening and mix just until dough forms rough ball around paddle. Scrape bowl with rubber spatula, and add remaining flour. Mix very briefly at medium-high speed, until dough has just broken up in smaller pieces. Transfer to medium bowl. Sprinkle vodka and water over mixture. With rubber spatula, use folding motion to mix, pressing down on mixture until dough is slightly tacky and sticks together. Remove 1 disk from refrigerator and roll out on generously floured work surface to 12-inch/30 cm circle about 1/8-inch/3 mm thick. For the filling, stir together sugar, starch and salt in a small bowl. Place drained cherries in large bowl. Sprinkle with sugar/starch mixture, and toss around until evenly distributed around cherries. Add vanilla and reserved cherry juice, stir until well combined. Immediately spoon filling into pie crust, and top with butter pieces. Place in refrigerator. Place one half of the stripes horizontally across cherry filling (starting with long stripe in the middle). Fold the 2., 4., 6. and 8. stripe in the middle, and over to the left side. Then place a long stripe vertically in the middle of the pie, (across stripes that are not folded over.) Unfold stripes back, so that they lay over the vertical stripe. Fold over 1., 3., 5. and 7. stripe to the left. Place another stripe vertically on filling. Unfold stripes back, so that they lay over vertical stripe. Continue weaving this way, until half of the pie is covered. Then start weaving the other side, folding every other stripe to the right. 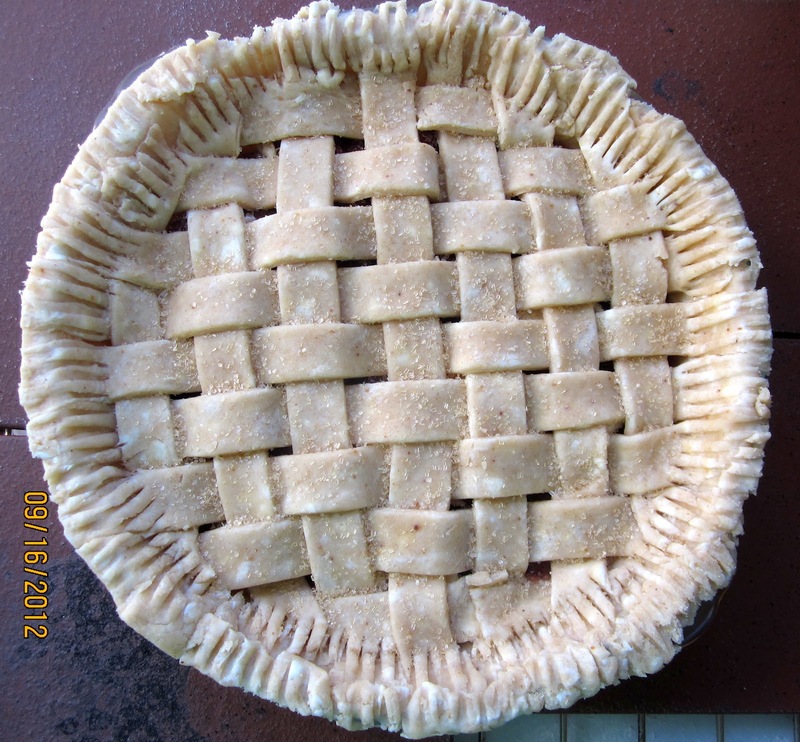 When the lattice crust is done, shorten overhanging stripes, until the are level with rim of the pie pan. Put rimmed baking sheet, upside down, in lowest position, and preheat oven to 425ºF/220º C.
Place pie on hot baking sheet and bake for 15 minutes. Reduce temperature to 350ºF/180ºC and continue baking for 40 – 50 minutes, until crust is deep golden brown, and filling is bubbling at the rims. Let pie cool on wire rack. TIP: To warm up pie, bake for ca. 10 minutes in preheated oven at 350ºF/180ºC. You can also freeze the pie, wrapped in plastic foil, in a zipLock bag. That is one beautiful tart! Looks perfectly baked! It looks really delicious! Your cherries are really cute, hope the plant will give you lots of cherries more to come! Thank you! I do hope for a more plentiful cherry harvest in the future.